You now that times are tough when people start going around and stealing newspapers. One woman in Pennsylvania has recently been arrested for such a crime, granted that it wasn’t just the one paper—instead hundreds at a time over the period of months. Why would anyone do this? What other reason than the insane amount of coupons that are contained within the pages that it holds. That is correct everyone, it wasn’t to read the paper or make the world’s most awesome papier-mâché anything or possibly a hat/boat so big that you could really ride in it—nope, just the coupons. There is a joke about extreme couponing in the original article, so I am not going to make an attempt to steal the credit for that from them, but come on people! Steal something better than just hundreds of newspapers at a time. 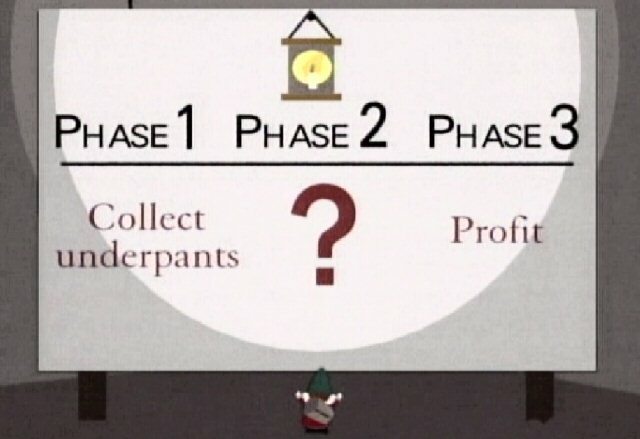 This is just like the underwear gnomes, you can clearly see the something that looks like an outline of plan but the moment that you start to put the thing together you quickly realize that it probably isn’t the best plan in the world. I am sure that in her mind this was going to make her a millionaire, I really just want to know how.